Success is often attributed to mutual chemistry, technique, and readiness to learn. I agree that those are important ingredients in the process. But in reality, they are steps to achieving results. And that's what we're looking for, right? How do we reach the movement and momentum we want? I was discussing performance management on an HR.COM webinar. Managers are often concerned about how to use performance data to really help employees. That thought popped into mind when, a little while ago, I was in the midst of a coaching session and realized that we were on a roll. So I started paying attention to what was happening--like watching a movie where you are one of the actors. When I looked at the plot, it revealed four components that I think are essential for a coaching session to be successful. When I repeated the phrase and asked him if that's where he wanted to go he smiled and his energy level went up noticeably. As a coach or client, ask the question: Is the excitement increasing because you've hit upon the real thing or an exciting thing? Confirm the real deal or go back to step 1. When we keep a goal or an issue to ourselves, there's no accountability for action. Once we state our desires or intentions to other people, we have a much greater chance of success. It's human nature. Tell someone else that you are planning on doing something and the likelihood of you doing it increases. Ask "Who else will you tell about this?" "Who else needs to be involved to help you accomplish this?" Create an immediate action--something that will happen today. Too often we become satisfied with the "Aha" and ignore the "Ah, when?" I ask for an action that can be taken before the end of the day. It creates momentum, makes something happen (we both get paid to make something happen), and shows genuine commitment. It also provides a specific action that allows for follow up. "What was the outcome of your phone call to the customer?" "How did your team react to your initial meeting about the new software integration? Commit to an action that will happen today. Finally, someone said strongly, "I believe I am next" and, at the same time, stepped forward right in front of the butcher. Following her move, there was a similar response at the ensuing, "Next!" This struck me as being similar to what we often see in meetings and presentations. In an effort to not want to stand out or seem "pushy", speakers do the "Aw, Shucks Shuffle". The result: people in the room wait forever--and uncomfortably--to get to the topical "meat counter". We're not. When you are in front of a room you've been given the responsibility to lead the rest of the group. This is a perfect time to remember: no one follows a tentative person. Here are some thought-provoking statistics from an article in the UK's Management Issues. "Research by UK performance improvement consultants Maritz has found that almost one in five of us (19 per cent) have never been thanked for our efforts at work while more than a third only hear those two little words once or twice a year. Perhaps not-entirely coincidentally, that's about the same proportion as another recent survey found have no loyalty towards the organisation they work for and couldn't care less about their job. Yet at the other end of the spectrum, around a third of us do receive regular recognition and are thanked several times a week, something that (as more than eight out of 10 of those surveyed acknowledged) has a positive impact on their desire to remain with their employer." 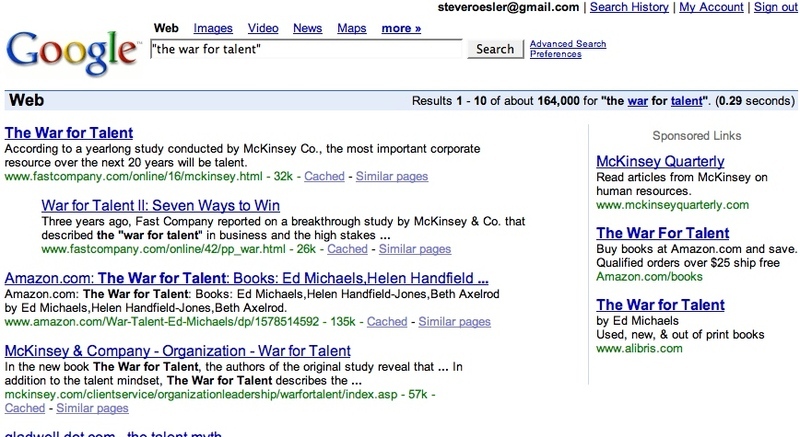 "Thank You" & the "War for Talent"
Check out the screen shot of "the war for talent" Google search. 164,000 results. Books, articles, training programs, software systems, and academic research. Conferences are being held to ponder the meaning of talent acquisition and retention. Let's assume for a minute that the statistics noted in the article are true. The third who receive thanks regularly feel positive about their employer and are inclined to remain at the firm. My suggestion: Executives need to start thanking their managers regularly. Then they need to tell them to start thanking their people. Maybe we could get uppity and call it "Building a Culture of Thanks." Clearly, it would be more effective and less costly than conferences and software. And it would make our mothers proud. Everyone wants to have influence; not everyone wants to build the relationships that enable it. There's a natural flow to being influential. Influence goes hand in hand with agreements. If you want to persuade someone to take a particular course of action, you need some agreements about what needs to be done and who will do it. That means taking time to reach an understanding about what is important to each of you. And that means building a working relationship. Unless you're willing to meet with a parole officer regularly, you can't get what you want by beating up who you need.